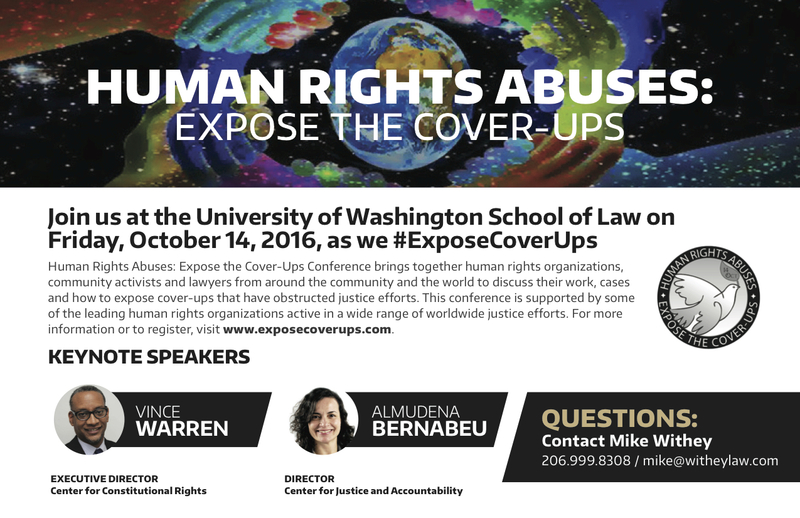 The Domingo and Viernes Story is pleased to work with the University of Washington School of Law and the Human Rights Center to convene a conference on Human Rights Abuses: Expose the Cover-Ups on Friday, October 14, 2016 at the UW School of Law. Don’t miss your chance to register for this unique and valuable conference at www.exposecoverups.com, where you will also find the full schedule of speakers and topics. Bringing together the leading human rights organizations in this country, including the Center for Constitutional Rights in New York, the Center for Justice and Accountability and the UW Center for Human Rights, the Conference provides a forum for victims, activists and litigators on the front lines of human rights struggles, with a particular emphasis on expanding the definition of human rights and share strategies for defeating efforts to cover-up crimes. Participants are approved for 6.50 CLE Credits (5.75 Law & Legal Procedure; 0.75 Ethics). The Co-Keynote Speakers include Vince Warren, Executive Director of the Center for Constitutional Rights who won a vital victory in the “stop and frisk” case against the NY Police Department and Almudena Bernabeu of the Center for Justice and Accountability, which won a jury verdict for the widow of slain Chilean songwriter Victor Jara against a Chilean military assassin. UW Law Dean Kellye Testy will address a luncheon speech to teaching human rights law in law schools. The crime was committed or reported to hide the true perpetrators involved, including how the murders were executed were designed to intimidate the victims into silence. Investigating authorities failed to uncover important clues, pursued false leads and failed to adequately investigate and prosecute the more powerful interests who stood in the shadows. Obstruction of justice was committed by governments and/or the perpetrators including by securing false testimony, perjured statements, withholding key evidence or documents and intimidation or violence against victims and eyewitnesses who could implicate the higher ups. Invocation of legal doctrines designed to thwart discovery of important evidence or grant immunity to official wrongdoers, including the “Act of State” doctrine, “National Security Privileges”, the State’s Secret doctrine, complete and/or qualified immunity for government officials and the erosion of the important principle of “universal jurisdiction” allowing any country to try persons accused of human rights violations. The Conference has the active support of over 15 human rights and community organizations, including Legacy of Equality, Leadership, and Organization (LELO), the Church Council of Greater Seattle, the ACLU, the Seattle Urban League, the Pride Foundation, the American Constitution Society, El Centro de la Raza and many others. It takes place at a crucial time, when the Philippine Supreme Court will decide whether Ferdinand Marcos will be given an hero’s burial in the Philippines as requested by its new President, strong-man Rodrigo Duterte. Don’t miss your opportunity to get involved today! For specific conference questions, contact Mike Withey directly at [email protected].